Its name is Sasquatch. Its mission: deliver the drinks; ten at a time. Your mission? Enjoy the long weekend. Preferably with nine friends! The rumors are true! Forget everything you know about cocktail shakers and upgrade to a our supernatural sized sasquatch cocktail shaker! 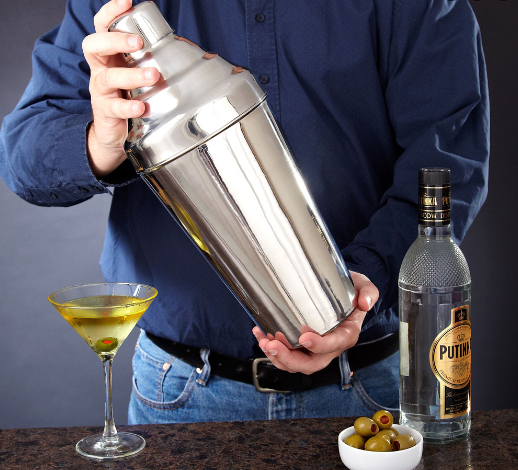 Large enough to scare off mild partiers at a glance, our giant cocktail shaker allows you to make martinis or margaritas for 10 all at once, and is sure to quench even the most monstrous of thirsts! Not only is it a conversation starter, it’s fully functional as well. With a giant cocktail shaker of this size we definitely recommend sharing among the villagers (aka guests), because no one person should try to take on this beast alone. Sasquatch extremely large cocktail shaker holds 110oz, is made of stainless steel, and features a built-in strainer to keep the fruit pulp and ice from escaping into the wild and into your cocktail glass. Shaker stands 15 ½” tall and can hold up to 110 oz. Hand washing is recommended.